Combine all ingredients except the instant oats and blend with a hand blender (or in a blender or food processor). Fold in the instant oats. 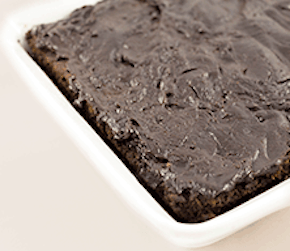 Pour into a greased 8″ Square baking dish and cook at 350 degrees for 1/2 hour. Let cool completely before icing or cutting. Best if refrigerated first. Combine ingredients and mix will. If the result is too think add a bit more agave.